In recent society, more and more people are keeping pets, so the pet food is in a large demand. Our Pet food machine is a new kind of single-screw extrusion bulking machine which is suitable in the large-sized, medium-sized, small sized Feeding Farm, Feed Mill and Foodstuffs Factory. It is mainly used for puffed food, Livestock and poultry feed or extruding single material, and it can also do the pretreatment of raw material in the vegetable fat and wine processing. Type: Flour, corn starch, rice bran, meat meal, bone meal, fish meal, soybean meal etc. Note: We can send you an recipe to make dog food when you make the order. The size could be Dia. 1-8mm. 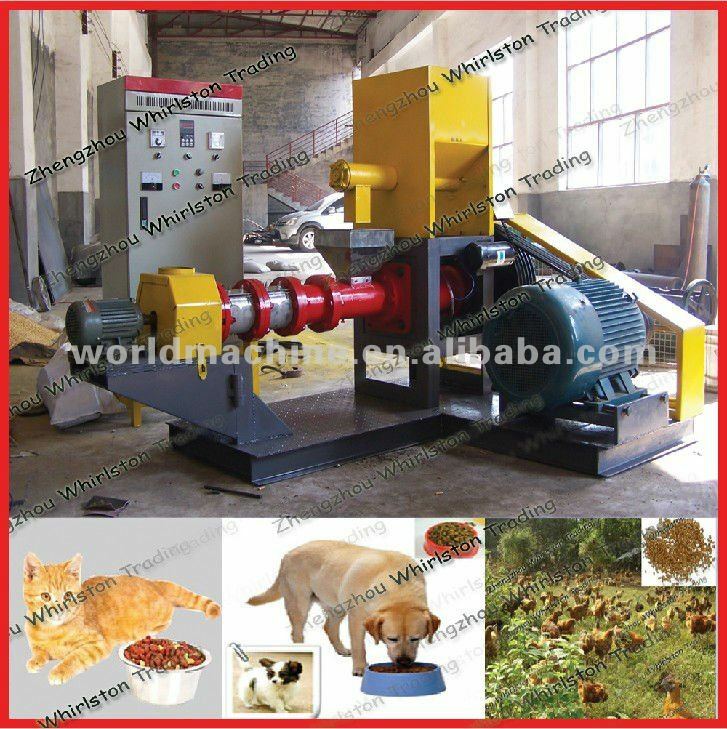 Our pet food machine can not only make common pet foods with different shapes as follows, but also make fish food with buoyant and sinkable form. And for the buoyant pellets, it can float on the water for at least 9 hours. During the process of producing feed pellets, the temperature of pellet press can reach 70-80 centigrade. At this temperature, fecula can be made into paste in pellet press. The inside granule is cooked fully, so the pellets will be not easy to go moldy and degenerative. This kind of cooked pellets can be stored for a long time and improve poultry dainty and assimilation function for feed animal. It also can shorten the period of feeding, so it can efficiently guarantee many users’productive cost. Pet Food Processing Line can make the pet feed with various shapes, taste and colors, with the scientific nutrition combination, keep our production always suit for the market. The Simply Flow Chart is Raw material→ crushing→ mixing → inflating→ drying→ cooling. But it requires different equipments collocation according to different raw material, different output and different requirement, we will be very glad to design the suitable line for you. Small animal pellet extruder machine/ pet feed extruder machine in line is the use of rice flour, flour and other kinds of grain flour as raw materials to add some vitamins, trace elements and other high-nutrition ingredients mixed uniformly after extrusion curing and then for nutrition to strengthen the rice, after drying, shape, appearance taste edible method and natural The rice is consistent and supplements the lack of nutrients in natural rice. can also customize special rice with different functions according to different groups of people. Jinan Joysun Machinery Co., Ltd. has single screw rice extruder and twin screw extruder. can be freely matched according to the requirements! 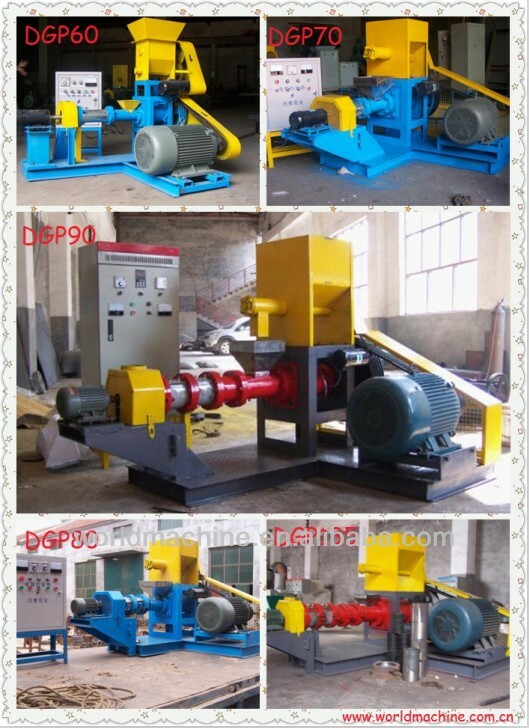 Small animal pellet extruder machine/ pet feed extruder machine in line technology is a breakthrough in the recycling of grain using the principle of extrusion. The most important feature of technology is the addition of various nutrients essential to the human body to food, producing a variety of health foods, curative foods and functional foods. The products are easy to eat and easy to use. Digestion and absorption, welcomed by consumers. Artificial rice alias nutrition rice, gold rice.